Numerous iPhone tripods are available online, however one new product promises to offer users a credit card-sized smartphone mount, which can support an iPhone in either landscape or portrait, and can rotate through a whole 360 degrees. Called Pocket Tripod, the accessory is currently available to back at Kickstarter, and can be preordered for a pledge of $25 or more (provided the product reaches its funding goal of $45,000). As you can see in the below image, while Pocket Tripod takes the shape of a credit card, and can therefore fit within one’s wallet or pocket, the product can fold up into an iPhone mount. When “assembled,” Pocket Tripod can support an iPhone handset in either portrait or landscape mode, and when in portrait the angle of the mount can be rotated 360 degrees across four 90-degree sweeps. Pocket Tripod is super thin – as thin as two credit cards stacked on top one another, in fact. Pocket Tripod can rotate through 360 degrees across four 90-degree sweeps. Portrait, Landscape, Upside-down, it all works. Since the iPhone has a uniform edge cross-section, it can fit inside the cut-outs of the Pocket Tripod with any of its four edges. This is what makes adjusting the iPhone to any angle possible with Pocket Tripod, both in landscape and portrait. Adjusting the angle of the iPhone with the Pocket Tripod is done the same way as on a full sized photography tripod. Unlike most portable stands that use tabs to lean the iPhone on, the Pocket Tripod actually gives you smooth, uninterrupted 90° sweeps of tilt adjustment. 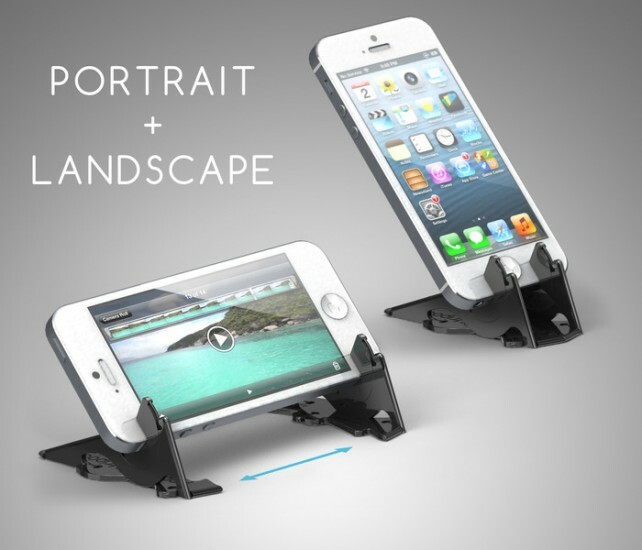 Its unique design let’s you quickly and precisely aim your iPhone to any angle you like. At the moment, Pocket Tripod is available to back and preorder at Kickstarter for $25, and the product will be available in either black or white models, compatible with the iPhone 4 and iPhone 4S, or the iPhone 5. There are, however, a number of bonus gifts available if users offer a higher pledge. Currently, the accessory has 28 days to meet its funding goal of $45,000. For more information on Pocket Tripod, take a look at its Kickstarter demo video, which is embedded below. Alternatively, for further accessory related news, see: This Week In Accessories: Six Perfect Gift Ideas For A Graduate, Run Out And Purchase X-Doria’s Dash Folio For The iPad mini, and ZooGue Is Offering A Special Memorial Day Sale.